Alter Bridge has built a solid reputation for being incredible live, and when that show is combined with a 52-piece orchestra, it makes for an epic viewing and listening experience. That’s exactly what viewers witness in Alter Bridge’s new live album and concert film, “Live at the Royal Albert Hall,” out Sept. 7. The band filmed “Live at the Royal Albert Hall” last fall during Alter Bridge’s two concerts at the legendary London venue. The majestic Parallax Orchestra accompanied the band at both shows, offering plenty of footage to make up this 21-song collection. 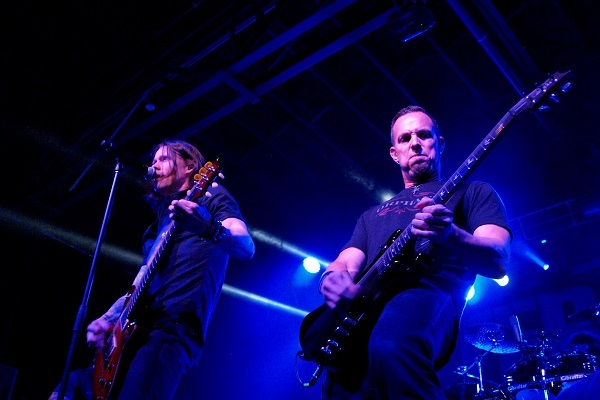 Performing with a multi-piece orchestra was a first for Alter Bridge, which says a lot, as the guys have been together more than a decade and performed sold-out shows around the world. The fact this was a first adds to the excitement of the band’s London shows, and that enthusiasm comes across in the release. “Live at the Royal Albert Hall” launches with “Slip to the Void,” the opening track off the band’s third studio album, “AB III.” From there, the guys kick into high gear with the pummeling “Addicted to Pain” off “Fortress” and continue through a career-spanning set of songs, including “Ghost of Days Gone By,” “The Last Hero,” “Broken Wings,” “Blackbird” and “Open Your Eyes,” to name a few. Watching and listening to “Live at the Royal Albert Hall” brings a fresh, new life to these popular Alter Bridge tracks, thanks in part to unique arrangements by conductor Simon Dobson. The massive sound of the orchestra in conjunction with Myles Kennedy’s powerful, ringing vocals, Mark Tremonti’s fiery guitars and Brian Marshall and Scott Phillips’ tight rhythms makes for many goosebump-inducing moments throughout the set.